Tempo in weight training is the rhythm at which you move a weight, including the rest time at the top of the lift and at the return of the weight to the starting position. For example, some training might involve explosive lifting at a rapid rate, while others may have a slower pace. If you are new to weight training, seeing results from your well-designed program is relatively easy when you are consistent and stick to it. After you've been training for a while, your gains will become less apparent, and you may even cease seeing results. This is often referred to as a "plateau." This is a normal part of weight training, and one of the solutions can be found in tempo. Adjusting tempo allows you to vary your training for better results. Weightlifting at a quicker tempo builds speed, strength, and power, but produces less muscle tension overall so your muscle size won't increase dramatically. At a slower tempo, there is higher tension in the muscle, which is key to building bigger muscle size (hypertrophy). The first number "3" is the time in seconds to lower the weight after you've reached the top of the lift. This is the eccentric or negative phase (lowering the weight), which is opposite to the direction of muscle contraction. The second number "0" is the pause between the eccentric and the concentric phases of the exercise. For the curl, this would be when the weight as at its lowered position. The third number is the time in seconds for the concentric (lifting the weight) or contraction phase of the lift. In the example, "1" means an explosive lift, which is also sometimes represented with an "X." In an arm curl, this would be lifting of the dumbbell, for example. 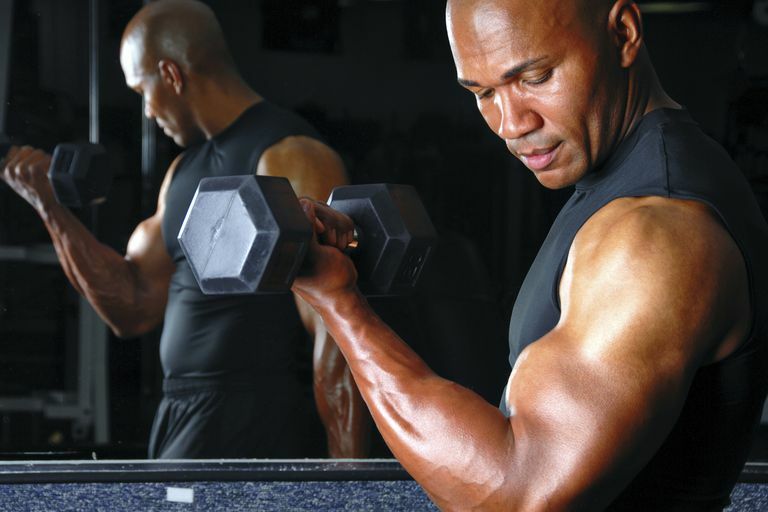 The fourth number "1" is the duration of the pause at the top of the lift, or when you have bent the elbow and lifted the dumbbell to the highest point in an arm curl. This number is sometimes left out. Depending on the exercise, this pause is important for muscle building because tension is held during the pause. For example, in the lateral raise, the deltoid muscles are fully contracted at this point, so holding the tension longer can produce improved hypertrophic results. Many schemes are possible, depending on the particular brand of weight training you might be using. Slow tempo training, for example, might use a three-second lift rather than an explosive lift. For novice and general fitness training, you could use 3331 or even 3631. Remember that the first number is the eccentric movement of returning the weight to the starting position while lengthening the muscle and increasing the joint angle.